Special to the DailyJared Leighty, aka DJ Largechild, has shared the stage with: Snoop Dogg, Wu Tang Clan, Lil' Wayne, Slick Rick, Talib Kweli, Mos Def, Gang Starr, Paul Wall, Blackalicious, Dilated Peoples, Digital Underground, BInary Star, Del Tha Funky Homosapien, Hieroglyphics, Living Legends, Mix Master Mike, and more. Any DJ who combines a Rolling Stones song with Warren G, is alright in my book. That’s just what DJ Largechild does with “What A Drag It Is to Regulate.” But it’s his “The Jackson Pit” mashup, a Michael Jackson meets Passion Pit gem, that really makes us want to get up and dance. Leighty, who grew up in Glenwood Springs and went to school in Aspen, now calls Denver his home base. He returns to the mountains this weekend for a free show at Montanas in Avon Saturday night where attendees will “get it all,” he said. 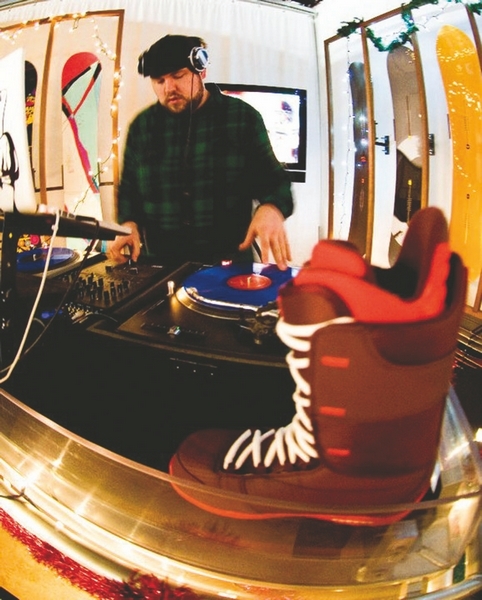 Leighty has DJ’ed during the Aspen winter X Games for the past three years. Vail Daily: Do you dislike Vail since you grew up near Aspen? Jared Leighty: I don’t hate anything or anyone to be honest. Vail is awesome. I have never really jumped on board with the whole Vail versus Aspen program. Vail is a great town to party in for both winter and summer. Everyone I know from there have always been really good people. I suppose my only complaint would be having to pay so much to park at Lionshead when I go ski. VD: How did you get your DJ name? JL: I am just a big kid on the inside. Immaturity is just an adjective boring people use to describe people who have fun all the time. I am definitely a glass-half-full kind of guy. I have been known to have the time of my life in any situation, no matter where I am at or who I am with. They always have called me a big kid, so being 6-foot-5-inches and 230 pounds, DJ Largechild seemed to stick. VD: You started out playing classical piano. How does that inform your work now? JL: Piano is my roots and passion for sure. Getting to know an instrument that well gave me a solid foundation for music and music theory in general. I love still being able to just pick up a piece of sheet music and play it like I am reading a book. With a better understanding of music comes a greater appreciation for all kinds of music. That will probably explain the intense diversity of my musical selection during my set. VD: You use a lot of vinyl in your sets, a rare thing these days. Why? JL: Most DJ’s I run into are on an MPC controller and laptop set up. That is all well and good for some shows, but it’s tough to really respect the artistry of turntablism when most of those programs match the beats up for you automatically anyways. Spinning on vinyl gives you a better sound quality and it’s what I have always done, so that is what I stick to. VD: Tell me about the last vinyl discovery you made that got you excited. JL: My most exciting recent find was a Green Vinyl copy of “Evilive” by The Misfits. Misfits are easily one of my favorite bands of all time, and they are known for pressing VERY limited runs of certain albums. The Green 12-inch version of “Evilive” had only 2,000 known first pressings in 1987. I got a copy online from someone who obviously didn’t know what they had. Most copies of this album for a first pressing go for upwards of $200. He sold it to me for a few bucks. VD: Name a song that’s stuck in your head recently. JL: Ha, good song or annoying song? Most songs that get stuck in your head are the ones that are overplayed and are just on repeat by other DJs everytime you go out. “Somebody that I used to know” by Gotye is the perfect example. It’s a great catchy song, but seems to follow me everywhere I go. A few months ago, it was “N****s in Paris” by Jay-Z and Kanye West. Again, great song, but played out. If you ask me for a great song that I can’t get out of my head that isn’t on the radio every eight minutes, I would say you need to listen to “Bass” by A$AP Rocky. VD: And a song you wish people would stop requesting. JL: Please stop requesting Britney Spears. She is a talentless nutjob in my opinion. I will be happy to play any song of hers though if you write your request down on a $20 bill and hand it to me (just so I don’t forget it). VD: Tell me about something coming up in the Colorado music scene this summer that you’re excited about. JL: July 26th. Red Rocks. Tenacious D. This one show will probably end up changing the face of music as I know it. I just hope my face doesn’t melt off.